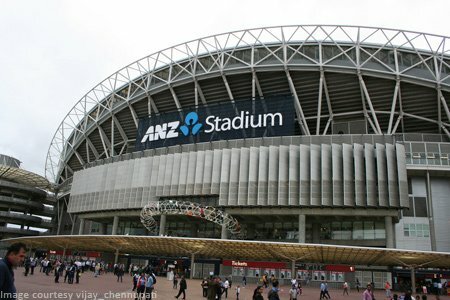 ANZ Stadium is located at Olympic Boulevard, Homebush Bay, in Sydney, New South Wales at the Sydney Olympic Park precinct. Comfort Inn & Suites Burwood offers affordable Homebush accommodation which is only minutes away from ANZ Stadium. Our Stadium accommodation provides suitable lodging at highly competitive prices ranging from Standard rooms to Serviced apartments, making Comfort Inn & Suites Burwood an ideal place to stay if you are planning on travelling to Sydney for a concert, game or other event at ANZ Stadium. A Courtesy Bus is also available to this venue for special events and large group bookings. Book online now or feel free to enquire about what’s on offer. Book online or call us now on 61 2 9744 0521! We’re located just 15 minutes from ANZ Stadium, making travel to events a breeze! We can also provide a free courtesy bus to this venue for special events and large group bookings. View availability and book online today! ANZ Stadium, originally known as Stadium Australia or Telstra Stadium, was built in 1999 as the focal point of the Sydney 2000 Olympic Games. At the time, there were no other outdoor stadiums available during the Sydney Olympic Games larger than the ANZ Stadium. ANZ Stadium has the capacity to seat over 83,500 spectators and has since become the main venue for major annual sporting events such as the National Rugby League’s New South Wales State of Origin series, NRL Grand Finals and Bledisloe Cup matches. Over 17 million punters have walked through the Stadium since its opening in 1999. The stadium is now host to regular Sydney Swans and Greater Western Sydney Giants AFL matches, as well as International Twenty 20 Cricket matches between Australia and India. It has also hosted many major concerts from international and Australian music acts including AC/DC, U2, Rolling Stones and Andre Rieu. See what’s on at ANZ Stadium and book your accommodation in advance.